It’s Lorrie here with a PhotoPlay meet Thermoweb feature for you. 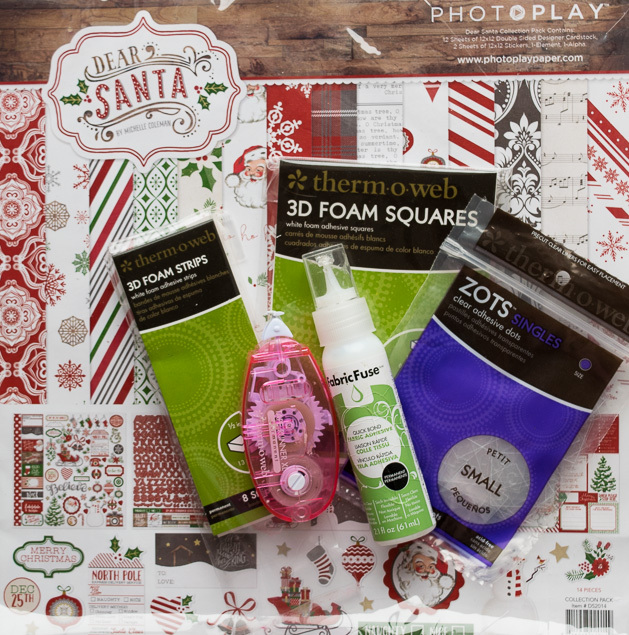 We have teamed up with PhotoPlay for our recent projects and I couldn’t be more excited. I just love this “Dear Santa” collection. I created a fun pocket letter for you, as well as a quick Christmas Card. Let’s start with the Pocket Letter. Are you following this trend? Pocket letters are so much fun! The idea behind pocket letters is a cross between a PenPal and a scrapbook. One creates a pocket letter and sends it to their “pocket letter pal” who sends one back. They are filled with goodies you can take out and use, or just leave as is. I, personally, collect mine and store in a 3-ring binder. Simply start with a 9 pocket trading card sleeve. Fill each pocket with goodies. You can see here, I’ve used the PhotoPlay Dear Santa collection. Using Thermoweb Adhesive Foam Strips and Foam Squares it’s super easy to create a lot of dimension in each pocket. For elements that you want to lay flat, I prefer the Thermoweb XL tape runner and or the Liquid FabricFuse. Yes, the liquid Fabric Fuse is perfect on paper and super strong! I used the Fabric Fuse to adhere the lattice piece to the card below. It is just perfect to get into those hard to reach, delicate areas. I want to thank PhotoPlay for allowing us to play with their collections. I had so much fun with the Dear Santa Collection. Don’t forget to grab my favorite Thermoweb adhesives mentioned above!